Browse: Home / MISP v-v2.3.39 released – Malware Information Sharing Platform. 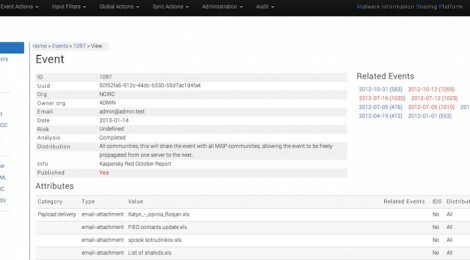 MISP v-v2.3.39 released – Malware Information Sharing Platform. NOTICE FROM US : FOR IT SECURITY PROFFESIONAL ONLY! AND EDUCATION PURPOSE ONLY! DON’T BE EVIL!!! – Exchanging info results in faster detection of targeted attacks and improves the detection ratio while reducing the false positives. We also avoid reversing similar malware as we know very fast that others already worked on this malware. Some people might think about CIF (Collective Intelligence Framework) and CRITs (Collaborative Research Into Threats), however those tools are different. Each one has its strenghts and weaknesses, but in the end MISP will rule the world of course. +This code is licensed under the GNU AFFERO GENERAL PUBLIC LICENSE version 3. ← Inception is a physical memory manipulation and hacking tool exploiting PCI-based DMA.